Sans Everything” explores a time so far in the future that humans have been replaced by disembodied intelligence. Set aboard a ship that invites the experience of traveling through the human life cycle, one embodied AI gets stuck on “As You Like It.” The resulting feud asks, how is humanity best expressed: through what we can do or who we are? Strange Attractor Theatre is Aram Aghazarian (Philadelphia, PA), Roblin Gray Davis (Juneau, AK), Jed Hancock-Brainerd (Providence, RI) and Rebecca Noon (Providence, RI). Together they create inviting and unexpected performance that challenges the popular conception of theatre while engaging new audiences with original, high-caliber, physically devised work. 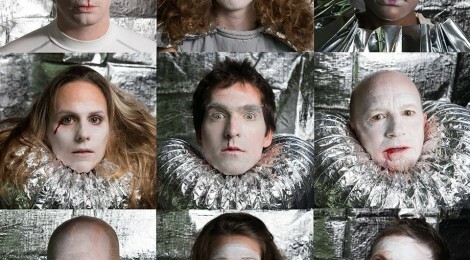 Lightning Rod Specialis araucous and contemplative physical theatre company based in Philadelphia. Their work engages a highly collaborative, actor-driven approach. With artistic roots in the Pig Iron School for Advanced Performance Training, Headlong Performance Institute, Double Edge Theatre, The Atlantic Theater Company, and long-form improvisation, LRS creations are a finely orchestrated extension of the raw and thunderous discoveries born from spontaneous inspiration. ← Yes! Doug Tuttle Album Release FRIDAY!